Ojas - what is this strange word, you may ask...? Well, Ojas translates as "vigor" in Sanskrit. The way I best describe it is: Immunity. In Ayurveda, one of our main goals is to build & further support immunity. When immunity is strong, the susceptibility towards illness is slight. We build Ojas in many different way, on of which is through diet! These super (duper) simple Ojas balls are chock-full of fiber, superfoods, & antioxidants! They are the PERFECT snack to support your daily nutrient intake. I usually eat these nuggets for breakfast with my coffee. 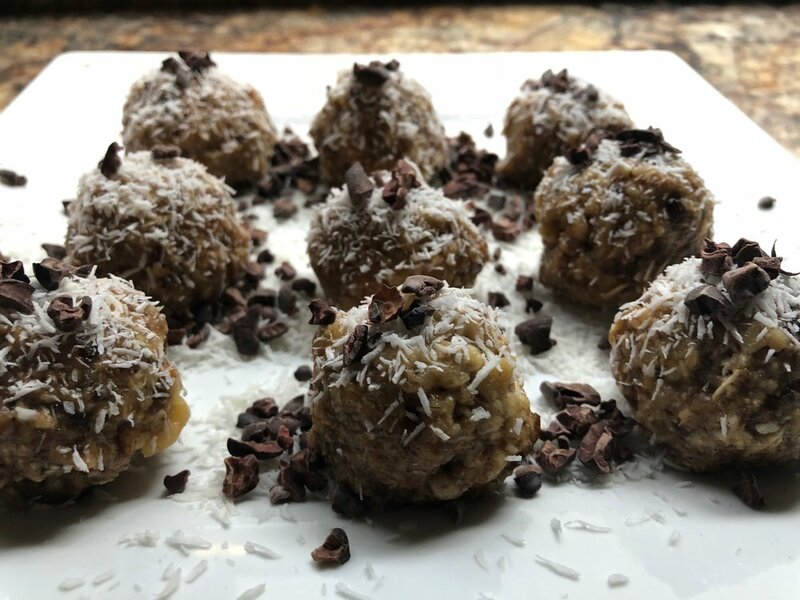 I do not normally work up a hunger until the afternoon; however, it commonly upsets my stomach to drink coffee on an upset stomach (& I LOVE my coffee) - therefore, I commonly eat these nutrient-packed magic balls bright & early to set my stomach up for success. These Ojas balls are the ticket for early mornin' nutrients & sustenance OR a sweet treat / energy booster later in the day! Gather your materials and blend together in a food processor. If your food processor is not large enough to support all the ingredients, blend in two batches. Mold your mash into lil' balls - size according to preference! I usually make them around the size of a jumbo gum-ball (slightly smaller than a ping pong ball). Dust your Ojas Balls with the toppings of choice! Feel free to adjust recipe according to your tastes!